Do Khyentse Yeshe Dorje was the mind incarnation of Jigme Lingpa and was one of the most accomplished tantric adepts the world has know in many centuries. His life was filled with miraculous events and circumstances. "He was conceived by a non-human father, born with miraculous signs, started speaking and showing power in infancy, receiving blessings and teachings from Buddhas and masters in pure visions, discovering many hidden objects and teachings as ter, awakening realization in many disciples, propagating esoteric Dharma tirelessly, and guiding many human and non-human beings into Dharma." He met Dodrupchen Rinpoche at an early age and immediately recognized him as his past incarnation's former student. He and his family went to live with Dodrupchen at Shukchen Tago Gompa for many years. 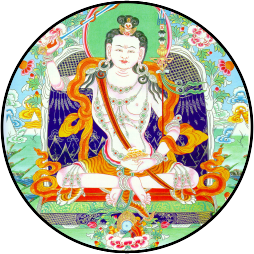 Yeshe Dorje received the textual transmissions and empowerments of the Nyingthig Yabzhi, Dzodun, Longchen Nyingthig, and Jigme Lingpa's writings. After some years living as a wandering ascetic Do Khyentse began giving teachings on the Longchen Nyingthig, establishing the lineage throughout Tibet. In 1866, after giving many teachings to even people on the street, he dissolved his physical body into the ultimate nature. At that time many incredible signs were witnessed including the trembling of the earth and rainbow lights filling the sky.